The workshop is taking place on the 24th and 25th of November 2010.Elvior’s experts will participate on another Workshop Organized by the European Telecommunications Standards Institute (ETSI) that is focused on the topic of IMS and IMS testing. Elvior’s founder and CEO Mr. Andres Kull will hold a presentation on the 24th of November on “IMS networks PSTN/ISDN simulation services conformance testing using ETSI standardized test suites and commercial TTCN-3 test tools”The presentation is an overview of conformance testing of IMS networks PSTN/ISDN services using ETSI standardized test suites and commercially available TTCN-3 test tools.For more information about the workshop and agenda, please visit the official website of the event. If our website did not provide you enough information on TTCN-3, then we advise you to visit www.ttcn3testing.com. The site provides an overview of the TTCN-3 testing language, a section for Frequently Asked Questions (FAQ) as well as offers overview of some case studies made about TTCN-3. The ttcn3testing.com is expected to grow and get more content on regular basis. So, if you did not find what you were looking for today, look back after a while and see updates or subscribe to the RSS for automatic information delivery. Model-based testing at an industrial scale offers a time-saving and cost-effective approach to software development. Results of a European research project are already enabling a wide arrange of European industries to improve their productivity and global competitiveness. The ITEA D-MINT project has turned the academic discipline of model-based testing into an industrial reality to cut the cost of producing complex software-based systems. Demonstrators in a wide range of industrial domains from street lighting and process control to mobile communications and automotive electronic control units clearly show how such an approach allows the cost-effective development of high quality software. The resulting techniques are already being exploited in their product development by several major European companies. Quality is crucial to continuing European competitiveness. Cost-effective and efficient development of complex software systems is essential for future European success in many key industrial sectors. A wide range of industries across many sectors must invest in and be the best at the development of complex software systems. For example, half the components in modern cars rely on software, while software is the main differentiator between increasingly standard off-the-shelf hardware in telecommunications. “To be competitive in the future, we need to invest in and be the best in the development of such systems,” says Colin Willcock of Nokia Siemens Networks in Germany, co-ordinator of the D-MINT project. “However 40 to 60% of the overall costs of developing software systems are in testing.” D-MINT sought to find out how to test complex software systems more effectively. This was important to a wide range of industries as represented in a consortium that included ABB industrial systems, Nokia mobile phones and automotive manufacturer Daimler. In classical software testing, the software and the tests for the software are written in parallel, involving the same level of complexity on the product and test sides. But, working at higher levels of abstraction and using models rather than actual code offers the potential for reuse as the models are in more general terms. After a knotty early phase, “much time and effort is saved later because errors are detected rapidly” says Willcock. Effectively, the classic advantages of model-based software development are brought across to the testing side. Model-based testing was applied at an industrial scale with industrial quality across eight separate domains – unusual for an ITEA project. Applications ranged from street lighting to video-conference units, from telecommunications to cars, and from industrial engineering to machine tools. “Trying to make a common project was a struggle but we came out with surprisingly homogeneous results and comments,” he adds. While productivity figures may have appeared modest in some applications, they could be backed up in real industrial cases with real figures and are more than sufficient to justify use of model-based testing. One result is that three test-tool vendors have already put their products on the market: iXtronics Toolbox, Testing Tech TTmodeler and Conformiq Qtronic. Moreover, several of the industrial partners are already starting to use the D-MINT techniques in their product development. Major industrial engineering company ABB is using D-MINT results for the next version of its Softstarter control products. Carmaker Daimler will use D-Mint technology for electronic control unit software testing. Most impressively perhaps, information and communication technology specialist ELIKO has already used the D-MINT approach for a street-lighting control card which is now widely employed in Estonia. The hardware had already been developed and the software tested when the customer completely revised the specifications to avoid the high cost of regular battery replacement. Classical testing would have required three man-months of effort to re-establish the current situation. Use of model-based testing enabled the company to generate the new test cases needed with only ten days of effort. Moreover, while classical and model-based software development took the same time because of the initial training required, subsequent use would eliminate this learning phase – exactly what happened with the radical redesign of the board. “The ELIKO case validated that model-based testing is not just more efficient, but the greater the change, the more the improvement obtained,” concludes Willcock. Download the full official press release by clicking here.Read more about the D-MINT project on Elvior’s website. Elvior has done number of case studies over the years. One case study was done in cooperation with Reach-U. The case study was published in the leading testing magazine named Testing Experience. The case study was conducted to test Reach-U’s Workforce Management (WFM) application, a web-based mobile positioning application developed by Reach-U. WFM is an application that can observe a workforce’s movement history, location and send SMSs to personnel via the web browser client. 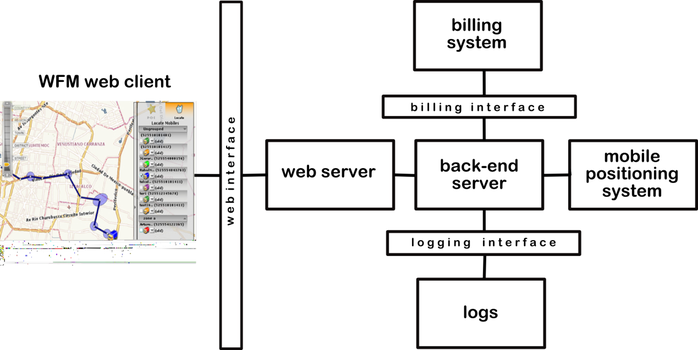 WFM’s users are primarily companies that would like to track and plan their workforce locations in real time.The architecture of the WFM:The case study was performed to evaluate the applicability of model-based testing for testing web services via functional and load testing – use cases where an operator uses a WFM web-client to locate targets were tested. Only servers that are part of WFM were in the scope of the implementation under test (IUT). A web client was simulated by the test system. It is noteworthy that testing the functionality of the web client was out of the scope of the case study. 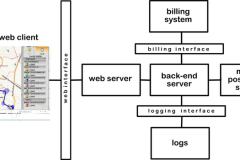 Overall feasibility of model-based testing technology for testing web services. Applicability of model-based testing technology for load testing. In the case study we used TestCast Generator (a test generator producing TTCN-3 test scripts automatically from the State Model (UML) of the IUT), TestCast T3 (full featured TTCN-3 test development and execution platform) and the JMeter (JMet) load tester. 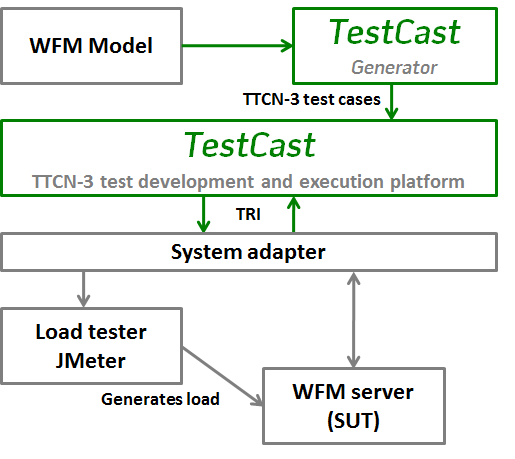 Additionally, a system adapter was developed to communicate between WFM and TestCast T3 as well as the JMeter load tester. 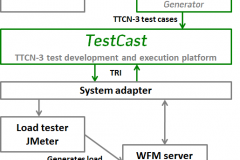 Firstly, TestCast Generator was used to generate TTCN-3 test cases from the system model. The test cases generated from the model were executed by TestCast T3. Test cases controlled the execution of JMeter as well. JMeter was used to generate the load for the server infrastructure of WFM. The test cases instructed JMeter to vary the load. Therefore, the test cases were communicated to two counterparts – the IUT and JMeter. In between, the system adapter was developed. The system adapter connected TestCast T3 to WFM and JMeter. The interface of the system adapter towards WFM provided HTTP message traffic over TCP/IP. In this way the test cases ran on the TestCast T3-simulated WFM web-client. The interface of the system adapter to JMeter allowed JMeter to be controlled by HTTP GET messages over TCP/IP. Results Overall feasibility of model-based testing technology for testing web services. In the case study the load tests and functional tests were used in parallel to test the IUT. The case study demonstrated the applicability of the model-based testing in general and TestCast Generato technology in particular for usage in load tests to increase the quality of overall testing.Moreover, it showed that MBT technology could be used over the borders of traditional functional black-box testing. In the case study the functional tests were generated out of the WFM model and used in conjunction with a load tester in order to prove the expected behaviour of the IUT in case of heavy loads. For more information about the case study and project please contact us at elvior@elvior.com. Testing Experience article: Case study- Testing of Mobile Positioning Web ServicesView more documents from Elvior LLC. Elvior LLC and Conformiq, Inc., a worldwide provider of software test design solutions, stepped into an OEM partnership to create the world’s first vertically integrated model-based testing platform. Under the agreement, Elvior licenses Conformiq Automated Test Design™ core technology to create a model-based testing solution that works in conjunction with Elvior’s TTCN-3 test development and execution platform, to be called TestCast™.Elvior’s new generation TTCN-3 test tool incorporating Conformiq’s test-generation technology will be named TestCast MBT and is expected to be available by the end of the year. TestCast MBT will be a single, integrated design environment for modeling the expected behavior of a system, automatically generating TTCN-3 tests, compiling and executing them against the actual system under test, and analyzing the results.See the press release to read more about the partnership.Read more about Elvior’s full-feature TTCN-3 test tool TestCast™. Elvior is taking part ofSpace Downstream Services 2010 and holding a poster session during the event. Elvior presents how model-based testingsolutions can save time and decrease time-to-market for a system/product while increasing the quality of such system or product at the same time. Come see more.Space Downstream Services 2010 Conference takes place in Swissotel Tallinn, Estonia on the 6th and 7th of May. Space Downstream Services 2010 Conference brings together researchers, market specialists, business executives, government representatives and leaders of regions to exchange and share their experiences, new ideas, and research results on diverse aspects of satellite services. Rationale: Fuel discussions about challenges concerning the delivery of services to users while developing innovative business models. You can read more about the conference on its website http://www.satfuturis.com/. We are glad to let you know that annual TTCN-3 User Conference (T3UC)is now open for registrationand the schedule is now online and availableto everybody. In January, Elvior became a Platinum Sponsorfor this T3UC 2010 conference. During T3UC 2010 Elvior is holding a tutorial session and holds a speech. On the 8th of June, Elvior holds tutorial at 13.30 until 14.30. 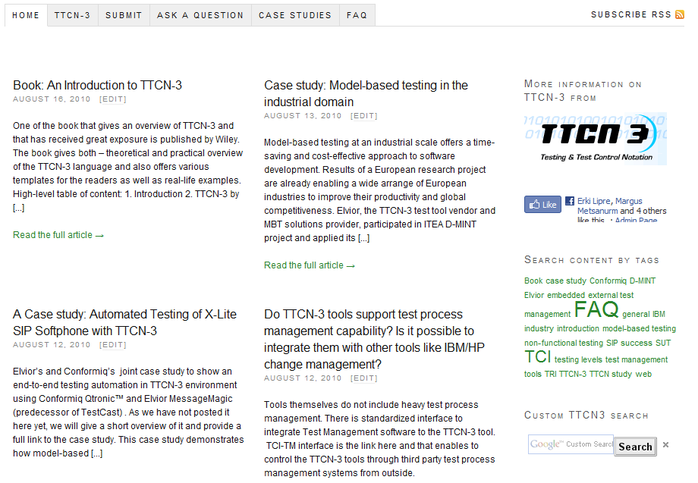 The tutorial topic is “TTCN-3 in end-to-end model based testing, explained on a case study“. On the 9th of June, Elvior is set up during the first session – Conformance and Interoperability Testing. Our speech takes place at 11.45 until 12.15. The topic of the speech is “Model-based TTCN-3 testing of a mobile operator charging subsystem“. We are looking forward to see you all there. If there are any questions in advance that you would like to put forward, please take the initiative to contact us via e-mail elvior@elvior.ee. TTCN-3 User Conference (T3UC) 2010 schedule is available here. TTCN-3 User Conference (T3UC) 2010 registration page. A new course “Software testing automation” will be held in the spring 2010 in the Department of Computer Science in Tallinn Technical University. The first lecture takes place in February 8, 2010 in the room VI-226. The course is mainly focused on TTCN-3 and supported by Elvior who provides lecturers, and TTCN-3 test tool MessageMagic.In Estonian:TTÜs tuleb 2009/2010 kevadsemestril (alates veebruarist) lugemisele aine Tarkvara automatiseeritud testimine “uues kuues”. Kandvaks teemaks saab sel aastal olema TTCN-3 nimeline testiarendustehnoloogia (www.ttcn-3.org). TTCN-3’e võib vaadata kui spetsiaalset programmeerimiskeelt, mis on loodud pidades silmas automaattestimise eripärasid. Kasutades TTCN-3’e on võimalik automatiseerida testimist erinevatel testitasemetel (komponenttestid, integratsioonitestid, süsteemitestid, süsteemide integratsioonitestid) ning erinevates rakendusvaldkondades – alates pangandusest, telekomist lõpetades autotööstusega (http://www.ttcn-3.org/SuccessStories.htm). TTCN-3 on näiteks aktiivses kasutuses ETSI (European Telecommunications Standards Institute) vastavustestides:- Session Initiation Protocol (SIP) for Voice over IP (VoIP),- IPv6 (Core, Mobility, Security),- Digital Mobile Radio (DMR) and digital Private Mobile Radio (dPMR) jneAine lektoriteks on palutud TTCN-3 tehnoloogia praktikud Elvior OÜ-st (www.elvior.ee).Kursus koosneb moodulitest (kokku 4 moodulit)- TTCN-3 alused (TTCN-3 – Testing and Test Control Notation Version 3)- TTCN-3 edasijõudnutele- TTCN-3 liidestamine SUT’ga (System Under Test; süsteemiadapterite-, platvormiadapaterite-, väliste koodekite-, väliste loggerite ehitamine; testide haldamise standard ja selle kasutamine TTCN-3’s)- TTCN-3 arendusplatvorm MessageMagicKursus lõpeb arvestusliku projektiga – töötav TTCN-3 testikeskkond koos projekti seletuskirjaga on arvestuse saamise kriteeriumiks. Elvior garanteerib kõigile osalejatele MessageMagic’u (http://elvior.ee/messagemagic/general) litsentsi 2009/2010 kevadsemestriks.Lisaks “põhiteemale”, milleks on TTCN-3, on plaanis kaasata täiendavaid tarkvara testimise automatiseerimist käsitlevaid loenguid erinevatelt spetsialistidelt (koormustestimine, mudelipõhine testimine, automaattestimine kui protsess, automaattestimise mõõtmine jne).Esimene, sissejuhatav loeng toimub 08. veebruaril algusega 10:00 TTÜs VI-226.Täpsem info kursuse kodulehelt: http://cs.ttu.ee/tiki-index.php?page=ITI8901TTÜ tudengid saavad kursusel osaleda vastavalt oma õppekoha tingimustele, kõigil teistel soovijatel on kursust võimalik sooritada Avatud Ülikooli kaudu (http://www.ttu.ee/au).Osalejate hulga täpsustamiseks palun potentsiaalsetel huvilistel anda mulle meili teel tagasisidet: maili@asaquality.ee, ka on samal aadressil oodatud kõik temaatilised küsimused! The TTCN-3 User Conference (T3UC) is an annual event which brings together the TTCN-3 community. TTCN-3 was initially conceived in Europe but then managed to establish itself quickly in Asia – especially China – as the international testing standard. As the TTCN-3 community is rapidly increasing, TTCN-3 has been used in new application domains and accumulated more positive experiences which are shared between more and more TTCN-3 users. T3UC 2010 will be held in Beijing, China, 8-19 June 2010.T3UC 2010 is co-organized by the BII Group and the European Telecommunications Standards Institute (ETSI), and supported technically by Huawei. It will feature tutorials and presentations from members of the TTCN-3 user community as well as keynotes from invited speakers.Elvior is supporting this event as a platinum sponsor and exhibitor, showcasing its TTCN-3 technology offerings. Elvior’s model-based TTCN-3 testing technology includes a model based test generator MOTES that generates TTCN-3 test cases from the UML state machines and MessageMagic TTCN-3 tool for tests development and execution.